Armstrong Hill | Real in L.A. 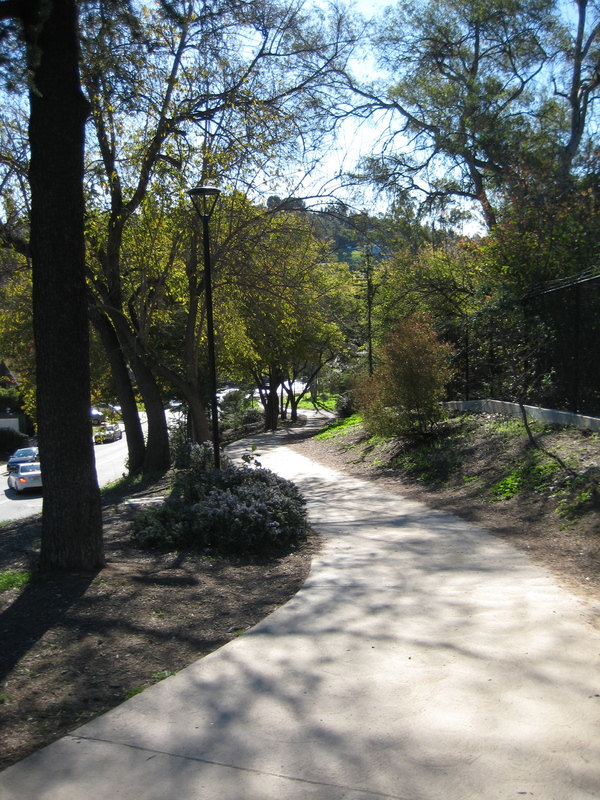 If you live on the east side of town, you probably know what this is: the Silverlake Reservoir walking path where it parallels Armstrong Avenue. The path has become a superhighway of sorts, a constant flow of runners and walkers in the mornings and evenings. In fact, there’s rarely a time of day when there aren’t people circling the reservoir. I don’t know how early they start, but I do know that I’ve driven by late in the evening–say 9 or 9:30–and there were people out there in the dark. I’m happy to see so many getting exercise, although I’ve also been known to complain about extra traffic and drivers who park with their rear bumpers across our driveway. It sure beats what was–or rather, wasn’t–there before. We’d walk on the roadway, even along Silverlake Boulevard, except where there were sidewalks around the dog park and rec center. The worst was Armstrong Avenue. A dirt path ran alongside the DWP property north of the hill, but stopped at the crest. Heading south from there, walkers either crept over a rock outcropping and around a few trees, then negotiated a steep slope down to Silverlake or walked on the street, which is a narrow, two-lanes. Somehow, no one ever got mowed down, though it wasn’t for lack of trying. I came up over the hill one evening, blind to what was on the other side, and found my lane taken up by a couple pushing a stroller, their dog beside them. I avoid running them over, but wondered if I should call in a report of child endangerment. You are currently reading Armstrong Hill at Real in L.A..